Pandora’s going in soon, I promise. Honest! It’s been so long since Pandora’s been in the water, it’s hard to believe that she will ever be underway again. However, the end of her time on the hard is nearing an end. Really!!! Trust me on this. You know how they say that “life gets in the way”? Well, it did. However, things are getting back to normal again and it’s time to go sailing. Yipee!!! I am happy to report that Pandora’s about ready to launch with only a few more last minute items to attend to. The yard is finishing up on the engine and I have applied the barrier coat and put on the bottom paint. Doesn’t she look great? I also refurbished the warp cutter on the propeller. 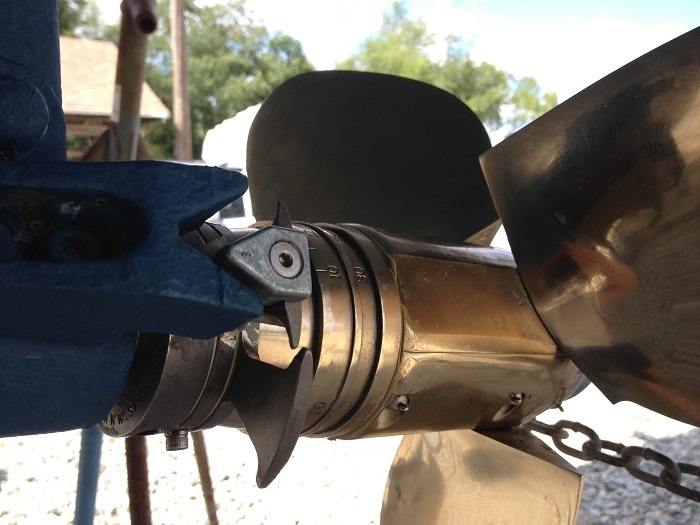 This nifty device, a Spurs cutter, is designed to rotate with the prop and cut any lines that might entangle the prop shaft. It has come in handy in the past, I can assure you. It wouldn’t be much fun to go for a swim to free the prop, especially at night. Yuck! It looks like it works and it does. Another view shows the business end of the cutter pretty well. Best to keep your fingers away from these babies when they are spinning around. The cutter to the left is kept stationary by the blue block on the cutlass bearing while the one on the right rotates with the propeller. Very powerful and quite effective. Finally, the infamous rudder bearings. 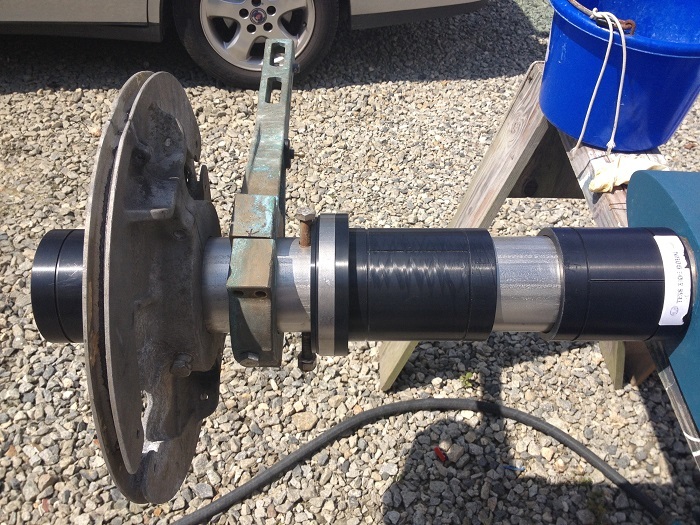 The three black sleeves are the bearings and they will support the rudder shaft in the stern of the boat. 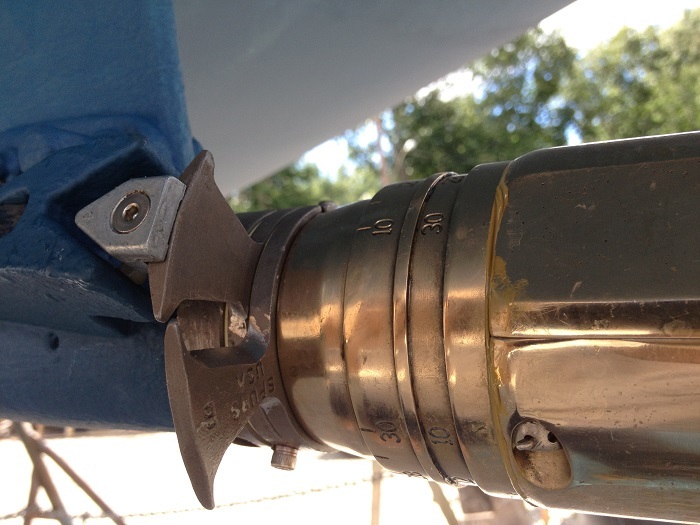 The center one, with the silver stripe on the top, has a “lip seal”, a rubber seal that will keep water out of the boat and yet still let the rudder move as needed. It’s a pretty neat design. The aluminum disk is the steering quadrant. Cables run around it and up to the wheel. As you can imagine, this gives huge leverage to the wheel in keeping Pandora on course. Also, the bronze lever is for the auto pilot. Beefy as well. All and all, a powerful combination to keep Pandora pointed in the right direction. That’s assuming that I can get her back into the water. I was delayed in getting the rudder back in as I messed up the measurements, that have to be within thousands of an inch, on the upper bearing so I had to reorder a new one. However, in the grand scheme of things, not a major issue and besides, I had other things in my life that were slowing things up anyway. The new bearing should be at the boatyard now so I hope to fit it and prepare for putting the rudder back into the boat on Wednesday or Thursday. Fingers crossed that everything will fit. So far, so good. As soon as Pandora is back in the water, perhaps by the end of the week, we hope to head out to Block Island and onto Newport. I can’t wait. Summer’s nearly over or is it about to begin? It’s hard to believe that Pandora has been out of commission for over two months. Two months when most of the rest of the sailing world was in full gear, heading out on vacations all over the North East. All the while, I have been working away, sometimes only for an hour or two a day during the heat spell, to get Pandora back in the water and on her way. 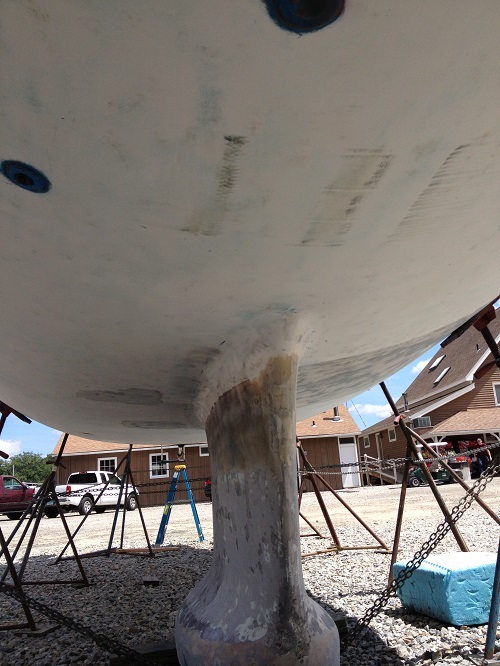 In a way I don’t really feel that I have done much and yet, the magnitude of sanding a 43′ boat down to bare gelcoat is a job and a half, for sure. Oh yeah, I also got my MaxProp back the other day and re-installed. It had developed a bit of slop in the gearing. No propeller should have this many parts. The prop is really an impressive piece of engineering. Here it is “engaged” and ready for action. When I don’t need the engine, the prop can be “feathered” Not a lot of resistance now. Just a little different. I have to say that this is as much a work of art as a propeller, and it costs about as much to buy, and repair. However, we won’t get into that. There’s certainly lots to do today if she is going to splash next week. So, I ask you, is summer nearly over as I write this in mid August, or is it about to begin? I say that it’s just beginning. With our plan to spend some time in Newport, the Chesapeake and on to the Bahamas for three months this winter, it’s indeed about to begin. Inching Pandora closer to the water. It’s a rainy Thursday morning and it won’t be a good day to work on Pandora. I am happy to know that our lawn is getting a drink but it’s unfortunate that I will loose today and likely Friday for working on Pandora. With a week or so till she splashes (I had hoped to have her in by August 15th) I am still a way off from being done and ready to launch. 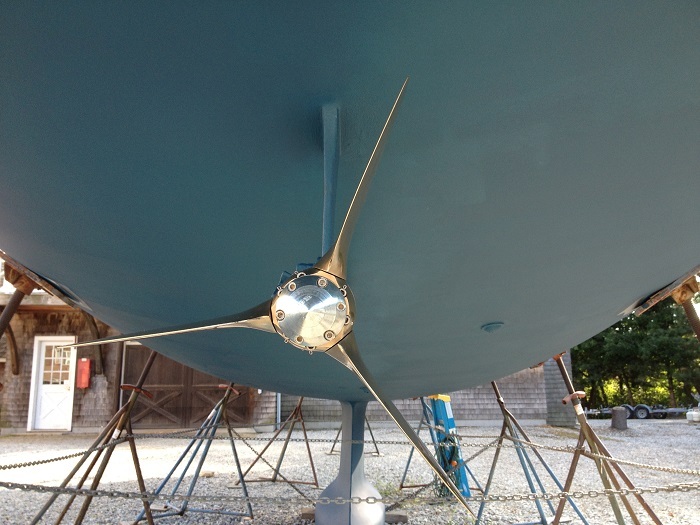 The biggest delay is because of the time it will take to get her new rudder bearings ordered, built and delivered. I was originally going to just order a new lower bearing, there are three of them, lower, middle and upper, that support the rudder structure. However, I decided to pull all three and order new ones. They are actually pretty simple, being basically very had plastic sleeves that the rudder post slides into from the entrance to the bottom of the hull at the stern through to the deck. The key issue, that took me a week to resolve, was to remove the old bearings and then to take measurements for the new ones. Getting them out was tough but the real delay was because of my anxiety about taking “perfect” measurements for the new ones. These bearings are built to exacting specs and are built to order. Yes, the prices are NASA worthy, as you can imagine. As they say, “measure twice, cut once” applies here. In this case, I measured twice several times, not sure exactly how many, actually. Here’s shots of two of the eight pages I scanned and sent to the manufacturer the other day. 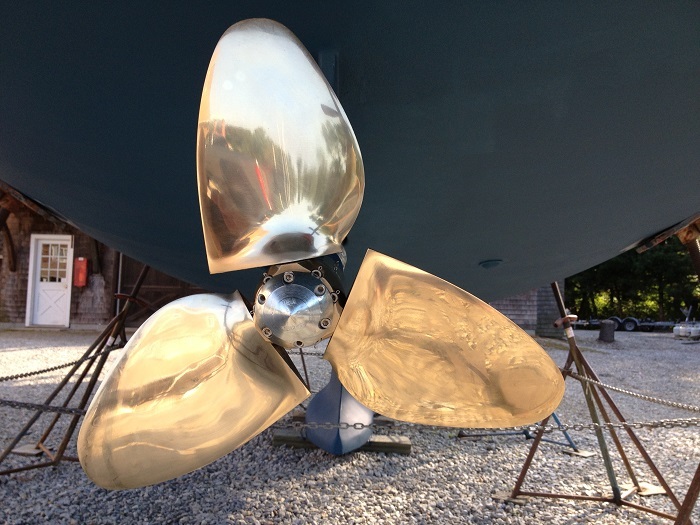 Amazingly, these measurements actually made sense to John at Tides Marine, who is making the bearings. 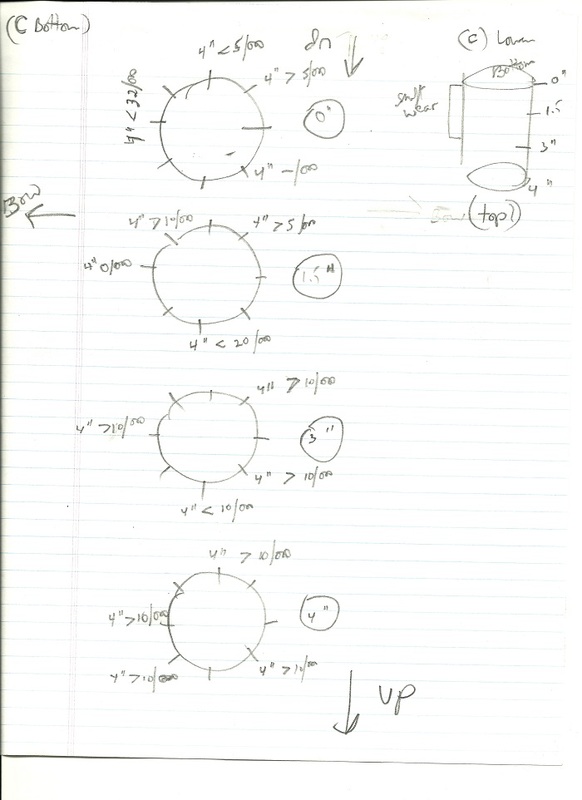 This one is measurements of the upper bearing. Huh, you say? Me too… At least this one has something on the page that looks like a rudder. Somehow these measurements, to the thousands of an inch, will be translated into the new bearings. A thousandth of an inch is pretty small. Not surprisingly, it takes a thousand of them to make an inch. Amazing. 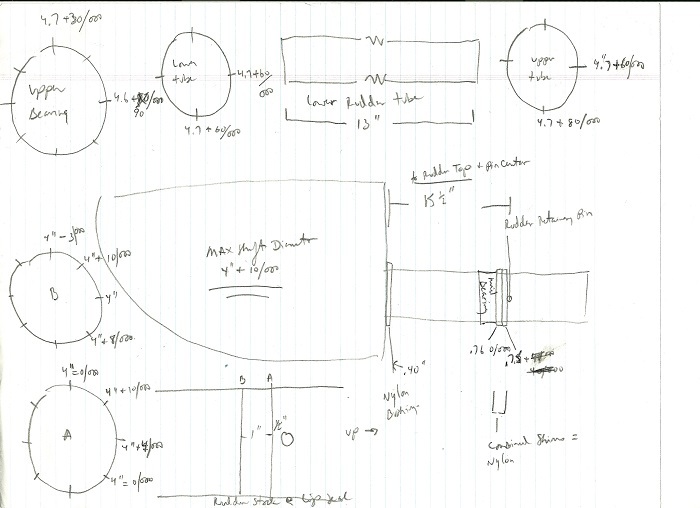 And, being off by one or two thousandths can make the difference between fitting and not… As you can imagine, with all of this being done via e-mail and phone, John will want me to initial, in blood, mine not his, the final drawings that they produce prior to making the bearings. My drawings will be taken and made into CAD (computer designed drawings) images and I will have to approve them and take responsibility for any mistakes. My fear of mistakes is why it took me a week to work up the nerve to say that my measurements were “final”. I’ll have the drawings back from Tides today or Friday, I hope. After I approve them, I am told that it will take five days to create the bearings in the shop in Florida where Tides Marine is located. I will be plenty nervous until I get these puppies into place and see that they fit. If not, it’s my nickel, many nickels actually, to get them fixed. Light at the end of the tunnel! And, closer to cruising. Yeah!!! The cooler temperatures now are making the heat and humidity of a week ago seem like a distant memory. Pandora’s bottom is all nice and white with ALL the bottom paint now gone. Yahoo!!! Given the glacial (to torture the temperature theme just a bit longer) progress of sanding the bottom, it’s hard to believe that it’s done. In the heat, some days, I was only able to do an hour of sanding before I pooped out. I felt like the job would never be done. The one redeeming feature of all that work is that I wasn’t paying someone to do it at $100 an hour. But now, it’s done and nearly ready to paint. The Pettit paint rep visited Pandora yesterday to survey my work and advise me on next steps in preparing and ultimately painting the bottom. For years I have been using Interlux products, and ablative paints in particular. Unfortunately, I haven’t been particularly happy with the results. 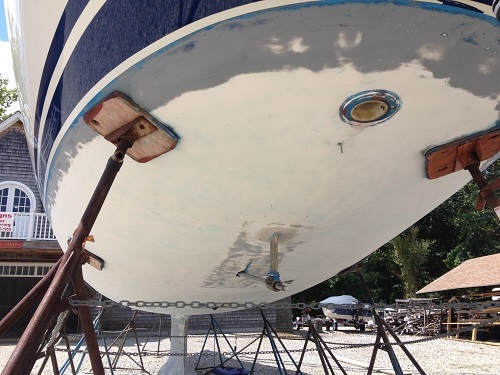 Ablative paints are designed to wear away so that there isn’t a nasty buildup over the years. 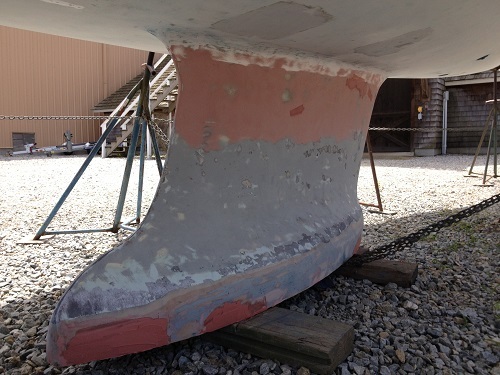 In my case, I found that the paint built up on the under body of the boat and wore away on the bow and up near the waterline. In any event, I have not been happy with the performance of the paint. Now that the bottom of Pandora, or to put it another way, Pandora’s bottom (Get it, Pandora’s bottom, sort of like Pandora’s box? 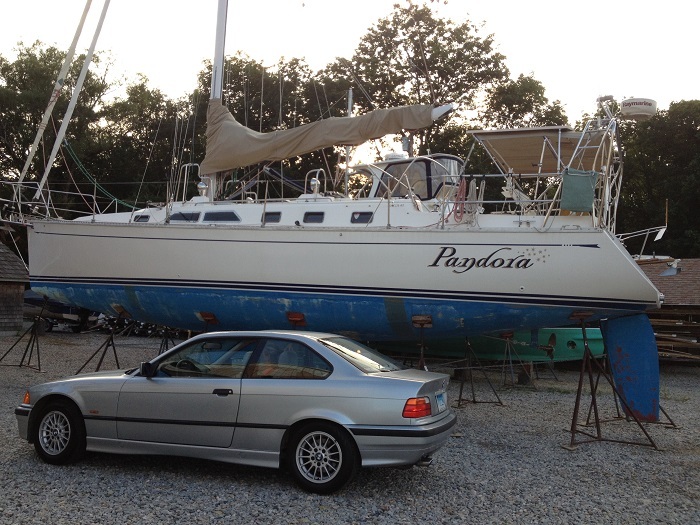 )… Anyway, now that Pandora’s bottom is white and paint free, the question is what sort of paint to put on. 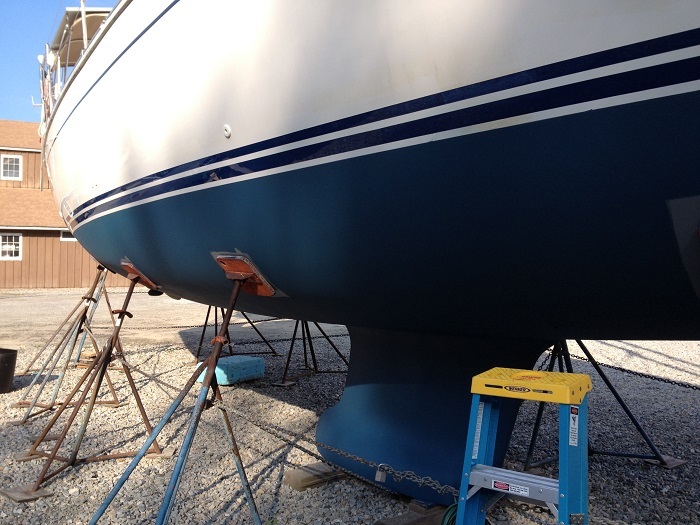 After speaking with the rep and telling him about our sailing in tropical as well as temperate waters, that’s Maine to the Bahamas, he really felt that a hard bottom paint, verses an ablative, would be the way to go. His reasoning is that Trinidad SR, the SR stands for slime resistance, was the way to go. Being a hard paint, I could also scrub the bottom to my hearts content and not wear it away. He also felt that the paint would last from 18 months to two years, the time that I want to keep Pandora afloat until her next haul out. Well, we will see how that goes. 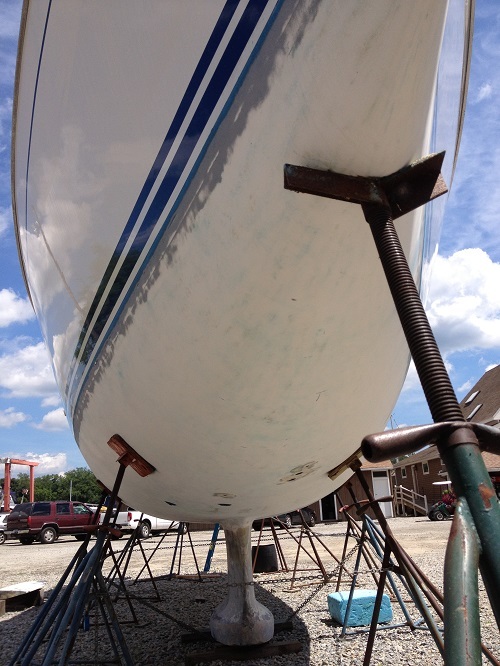 After nearly 30 years of sailing with ablative bottom paints, this will certainly be a change. As I think about the 30-40 hours, perhaps more, of sanding time that I put in over the last few weeks, let’s hope it’s a good decision. Fingers crossed. 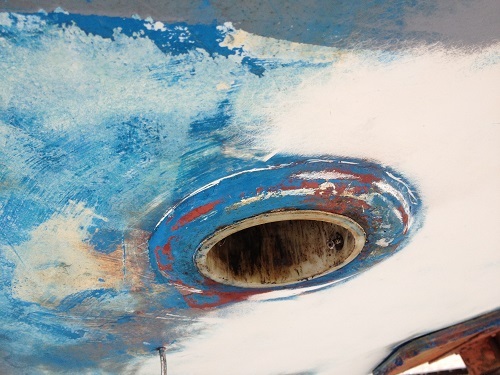 Who could ever think that a sanded boat bottom could be beautiful. I guess that beauty is in the eyes of the beholder. To me, a beautiful bottom. Isn’t having a great looking bottom what it’s all about? Actually, I should feel pretty pathetic spending hours sweating in the heat when others were out sailing. More importantly, I retired from a job where I was well paid so that I could do manual labor every day. While I was in the midst of the sanding with sweat dripping off of my chin, I had to wonder what the H^$# I was thinking. Now that it’s “done”, I am happy to be in the “manual” part of my life. It’s certainly a whole lot less stressful. Did I mention that on top of everything else, it takes over two hours to cut my lawn? At least I can have more ice cream. Yes, that makes it all worth while, manual labor and ice cream, the perfect combination. I also spent hours cutting out the three rudder bearings, the nylon sleeves that the rudder stock turns on as they had gotten a bit sloppy, making the rudder clunk in a seaway, over the years. Getting them out was really tough and the mere thought of messing with Pandora’s steering gear made me weak in the knees. There isn’t any system on the boat that is more important than being able to control the boat, that’s for sure. 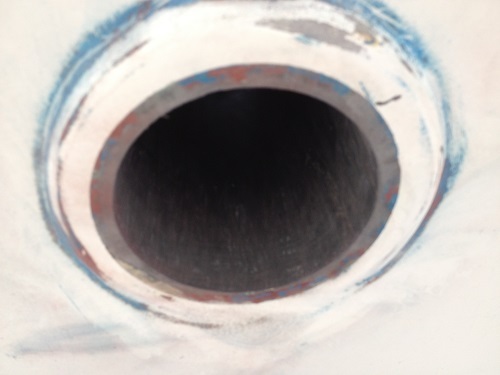 The white plastic sleeve in this photo is the lower bearing. It looks simple enough but it took me hours to cut it out. Now it’s ready for the new bearing. The yard is about finished working on the engine. 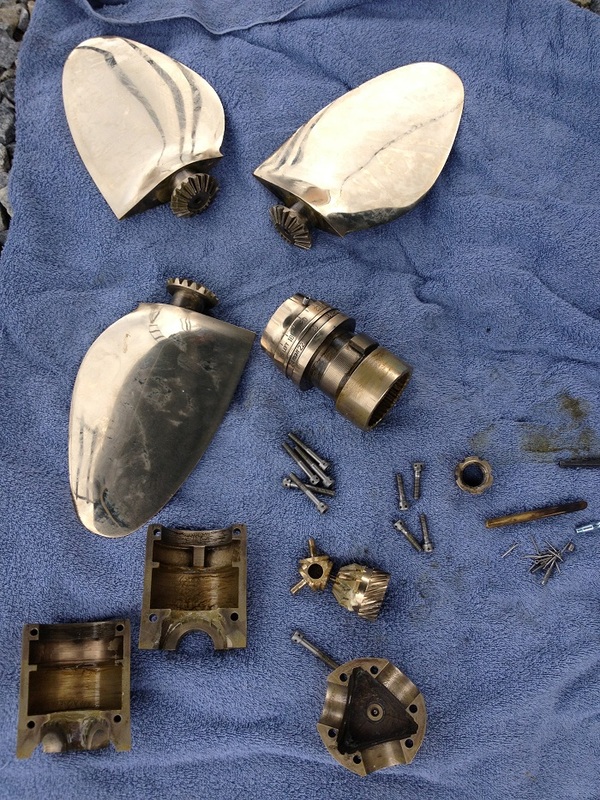 With over 3,000 hours on the little Yanmar, I decided to have them go over every aspect of the engine to be sure that everything was in tip top shape. They did plenty, based on the bills so far, but I am very pleased with their work. Amazingly, the yard, Brewer’s Marine in Deep River, offered two months of free storage as long as I have them do work on the boat. It seems that they love me so much that that they threw in a free haul and power wash as well. Clearly, they are not as busy in the summer as in the winter. 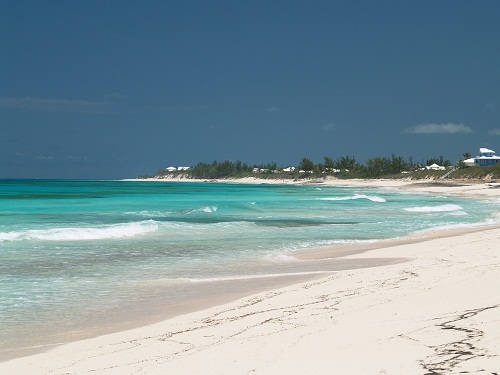 Another reason to spend the winters in the Bahamas, free storage and haul out too. And, all that only three miles from home. My plan remains to put Pandora back in the water in mid August. After splashing her, we plan to spend a week or so sailing to Block Island and on to Newport where we will take in some of the tourist sites. I can’t wait to be back on the water. Perhaps I’ll close with a few shots of places that we have visited care of Pandora. In no particular order some special spots. 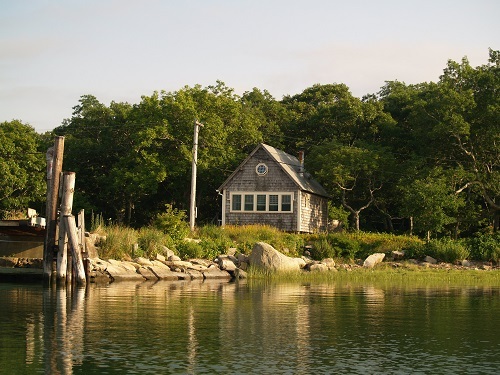 A little cottage on the shores of Hadley Harbor in Nashon Island near Woods Hole MA. Friends of ours, Toby and Martha Forbes stayed there one summer and we visited them, so many years ago in our little catboat. Indeed, several lifetimes ago for us. Visiting gardens has been a special part of our cruising experiences aboard Pandora. 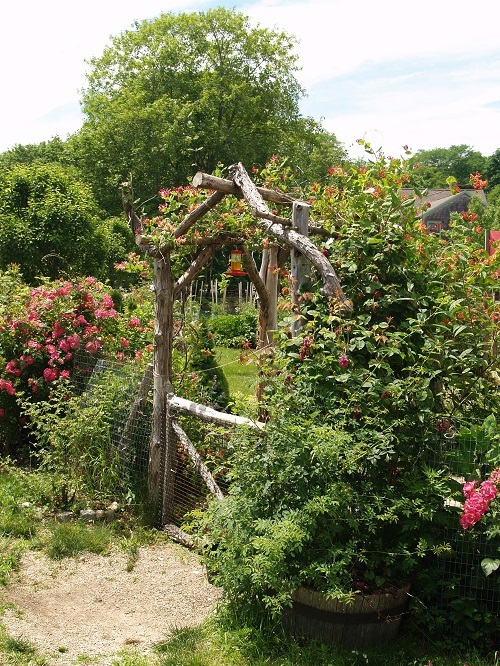 This community vegetable garden, on Fisher’s Island at the eastern end of Long Island Sound, is a special favorite. Perhaps it will be on our itinerary later this month. 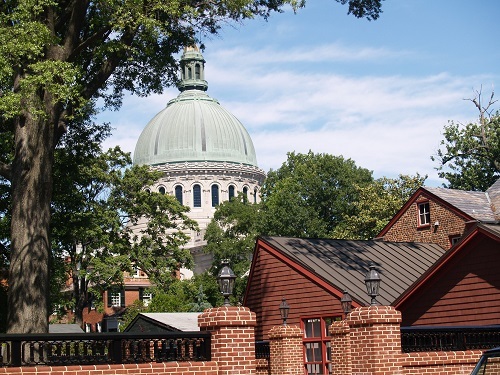 Annapolis, and a visit to the Naval Academy Chapel, will be a part of our fall travels. 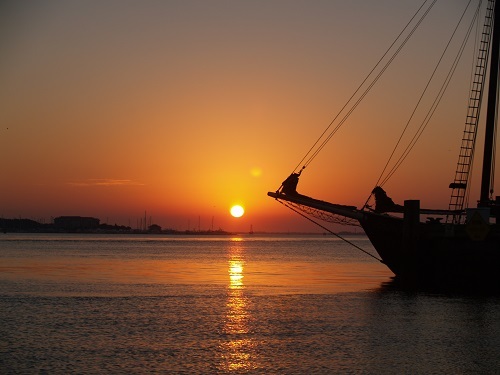 We plan on spending a few weeks cruising the Chesapeake before I run Pandora to Florida. 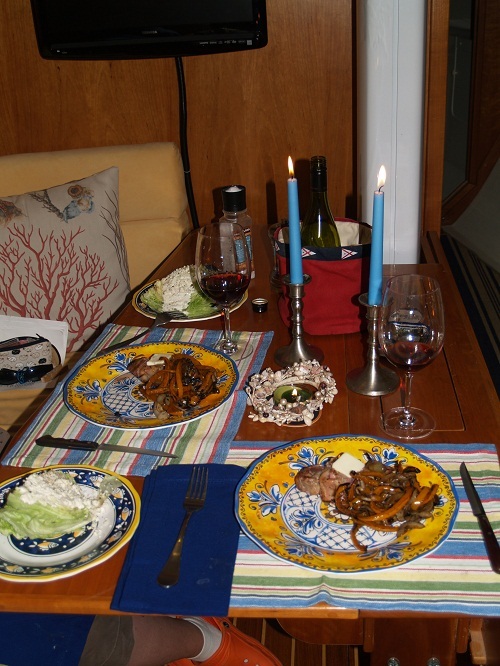 I am particularly looking forward to special dinners aboard. 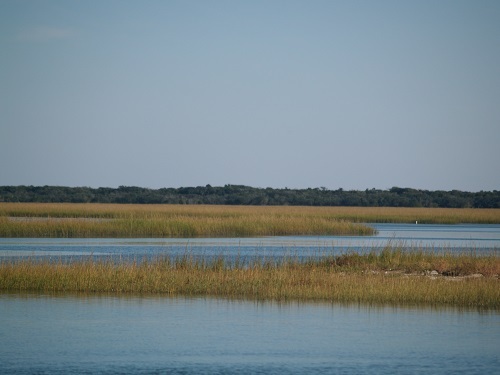 And the never ending marshes on the ICW. 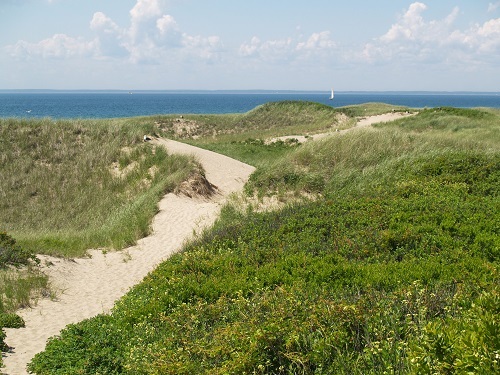 Perhaps we will walk out to the lighthouse on Block Island. It’s a beautiful Island. We’ll be there in a few weeks. 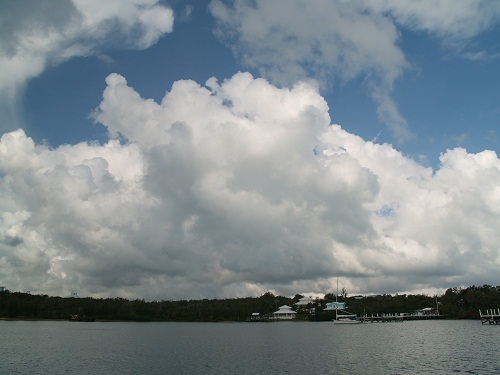 I am so looking forward to the magnificent cloud displays of the Bahamas. 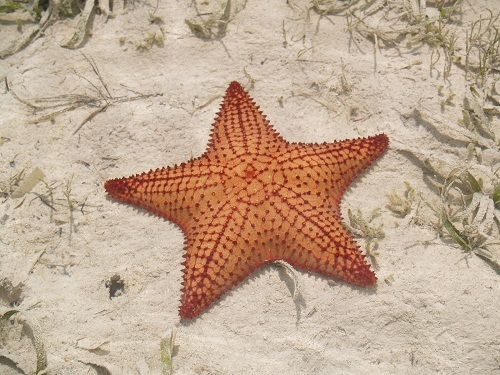 Speaking of clear water, it’s hard to believe that this starfish is actually in the water. 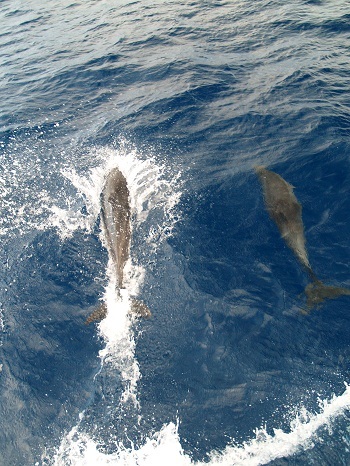 I can’t wait to visit 100’+ visibility waters again, and soon. Well, this reminiscing isn’t getting anything done on Pandora so I’d better sign off for now. Quick, how does the Flipper theme song go again?